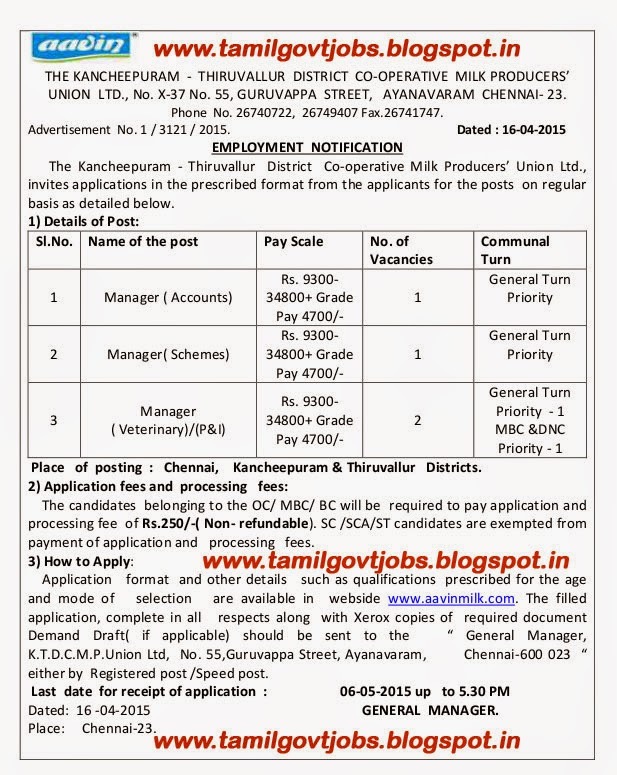 Applications are invited for Manager vacancy in Kancheepuram Thiruvallur Districts Co-operative Milk Producers' Federation Ltd (KTDCMP) through direct recruitment process. Manager (Accounts) - 1 Post (UR) - Basic Pay 9300 Grade Pay Grade Pay 4700 in Pay Band II category - any Bachelor's Degree and CA Inter / ICWA Inter - Age 30 years. Manager (Schemes) - 1 Post (UR) - Basic Pay 9300 Grade Pay Grade Pay 4700 in Pay Band II category - Bachelor's Degree in Veterinary Science (BVSc / BSc) - Age 30 years. Manager (Veterinary / P&I) - 2 Post (1 UR ; 1 MBC) - Basic Pay 9300 Grade Pay Grade Pay 4700 in Pay Band II category - Bachelor's Degree in Veterinary Science (BVSc / BSc) - Age 30 years. Chennai, Kanchipuram and Thiruvallur Districts. Application Fee Rs.250 for UR / BC and MBC candidates. There is no application fee for SC / SCA / ST candidates.